The Vita Spa Envie is a great 6 person hot tub moving towards the luxury end of the market with a mid range price. 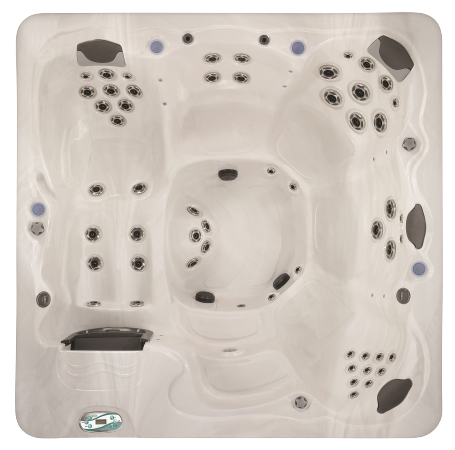 Featuring one large lounge seat plus five standard seats, this is a roomy hot tub for up to six adults with 64 jets. Combined with the power generated from 3 pumps, the Envie has a host of luxury features including the steel framed construction along with LED back lit fountains. This is a great hot tub if you are looking for a six seater with strong hydrotherapy and a mid range price bracket along with additional features. The Envie 6 seat large hot tub is available to buy from Bay Spas in the South West with a full, delivery, installation and setup service along with guidance on how to get the most from your hot tub. We love the Envie because it is backed by the great build quality that you get from Vita Spas along side some fantastic additional features such as the MP3 music system and the safety entry steps. For more information, please contact us and we will provide you with a full no obligation quote to include delivery and installation.